In my paintings I concentrate on the perspective of Modernistic buildings from the mid century. The perspective lines seem to construct buildings and planes while at the same time they lead to invisible vanishing points. Together with layers of transparant colours that reflect walls or suggest unexpected look-throughs it creates a confusing maze. For the observer there is nothing to hold on. In this installation the confusion of a 2 dimensional perspective in a 3 dimensional surrounding is the basis of the project. 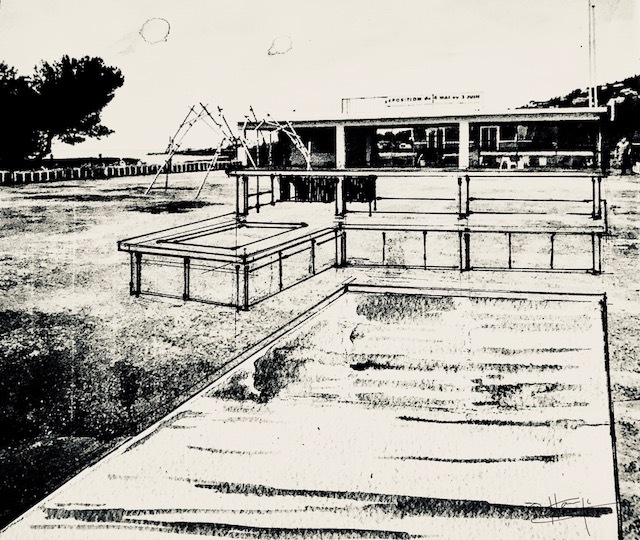 It strikes that the building Port Tonic has the same straight lines and open spaces as the constructions of Mies van der Rohe and Le Corbusier. By exploring the space leading to the building I want to emphazise this tendency. On the gray asphalt the verticals and horizontals of the buildings are extended by lines of white paint. For the observer walking by however the lines look randomly put down without any reason. 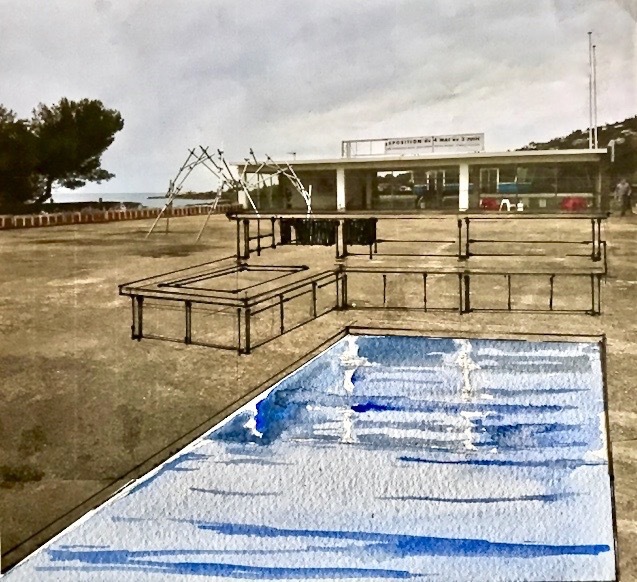 Only when he or she reaches the viewer point where the perspective starts to work, the drawing on the asphalt together with the existing building suddenly transform in a three stories high modern structure with a swimming pool in front. One step further again it collapses in a maze of lines leaving the observer confused. The swimming pool will be a mixture between a painted illusion and real existing object. In the pool the reflection of the building is painted together with a perspective deepness of it in blue. A real concrete border around the pool makes it possible to have a thin layer of water covering the painting to optimise the illusion.